Harley Schlanger, the LaRouche spokesman for the Western region of the United States, has just completed a two-week stay in France. However, mentioning his official position, important as it may be, does not begin to express what he has contributed to us. I will attempt to formulate it better here by saying that he opened to us the gateway to our capacity for human creativity in all domains, in art as in science, in poetry as in music, in politics as in economics. As American as an all-terrain Jeep, Schlanger offered those who had the opportunity to hear him speak, the conviction that America can be the conveyor of the best of European culture, if the fight is taken up to uproot the influence of British oligarchism, both in the U.S.A. and elsewhere. The stunning paradox is that this fight, at the same time, awakens the best of our own French culture, leaving behind today's underling mentality for the greatest moments of our history. Harley Schlanger with members of the French LaRouche Youth Movement, in Paris on Oct. 22. Those who accompanied Schlanger in Lyon, during his visit to the Center for the History of the Résistance and of Deportation profoundly felt this resonance between our international struggle today, as patriots and as world citizens, and that of the leadership and innumerable unknown individuals who sacrificed their lives back then. In the three well-attended public meetings on the American situation, before more than 200 people in Paris, Lyon, and Rennes, Schlanger took the opportunity to convey to our activists and friends, the message of Aeschylus' Prometheus. He showed us that with this drama, not only was the principle of fire brought to men, but, above all, he showed how the Titan had ``planted hope inside them.'' It is this hope, immortal within man, whereas our bodies are themselves mortal, which is the foundation for any politics worthy of the name, transmitted from one human being to the other, and from one generation to another. Schlanger took as a contemporary example of this fight for hope, for which Prometheus accepted to suffer knowing the destiny that awaited him, the fight of his own wife Susan, who had died of cancer in July. He showed how she fought for more than two years, up to the last moment, using the best of the universal Jewish culture, to nourish both with ideas and the financial contributions she raised, the youth of the LaRouche Youth Movement, who are our hope. Hence, against the domineering and destructive mind of Zeus--the real tragic figure in the play, for he is incapable of knowing his destiny--each of us can bear within himself a small Prometheus, which can grow stronger to the extent we each rise up against the challenges of injustice and pettiness, a principle of immortality that becomes expressed in serving the common good, and those generations yet to be born. 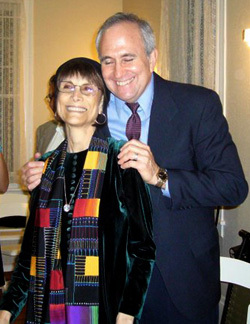 Harley Schlanger, with his wife Susan. Schlanger strolled through the streets of Paris, Rennes, and the old inner city of Lyon with immense pleasure. We exchanged tales of Yiddish humor that send small things back to their little importance, and make grow the larger ones by means of irony, the indispensable complement of tragedy. An expert on the three Moseses--the first Moses, Maimonides, and Mendelssohn--as well as on Sholom Aleichem and the renaissance of New York Yiddish theater that inspired the collaboration of so many Jews and African-Americans in the Civil Rights Movement, Schlanger sees great hope in the rising ferment of the mass strike in the United States, provided we know how to inspire it. Schlanger, himself an accomplished amateur violinist, also gave the 40 members of the LaRouche Youth Movement in France a magnificent presentation on the collaboration, over time, among Bach, Haydn, Mozart, and Beethoven, showing how the musical themes of the first were taken up and developed by the latter three, as in the five fugues of Mozart's K. 405, where he transcribes the four-voice fugues of Bach's ``Well-Tempered Clavier'' for the four instruments of the string quartet. This dialogue of voices from the past inspired all of us in the present, especially since Schlanger also showed us how, in Le Nozze di Figaro [The Marriage of Figaro], Mozart politically attacked the oligarchy of the Habsburg world, based on the libretto of Beaumarchais, Benjamin Franklin's collaborator in Paris, who financed the cannon of Rochambeau and the American Revolution, inflicting decisive defeat on Cornwallis at Yorktown. Schlanger also had the opportunity to meet several leading French economists who fully endorse the return, internationally, of Roosevelt's Glass-Steagall Act, to uproot the current crisis. Schlanger came to France 25 years ago. We all committed ourselves to having him back soon.